This forklift certification guide is designed to help business owners, supervisors, mangers, safety professionals, and forklift operators (new and current) by answering in detail the many questions we have received through the years. We hope this information answers your questions. It is fair to say that this is not an exhaustive list so if you have additional questions please feel free to contact us and we will be more than happy to answer any questions you may have. We developed this forklift training guide for business owners with the intent of answering the many questions regarding OSHA forklift certification requirements. There are a lot of very good forklift certification safety training companies in Wisconsin, Upper Michigan, and in the United States as a whole. Knowing what is required by the OSHA standard 29 CFR 1910.178 is extremely important when looking for a forklift training/certification class. 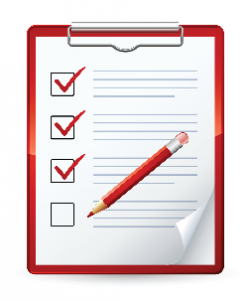 Below is a list of topics designed to help you the business owner in choosing the best training program for your operators. On May 29, 1971 (36 FR 10466), OSHA adopted many existing Federal standards and national consensus standards as OSHA standards under Section 6(a) of the Occupational Safety and Health Act (OSH Act) (29 U.S.C. 655 et al.). Section 6(a) permitted OSHA to adopt these standards without rule making for a period of two years after the effective date of the OSH Act. The hazards present in the workplace; and the operator’s demonstrated ability to operate a powered industrial truck safely. The operator is assigned to operate a different type of truck. Forklift Re-certification: OSHA requires an evaluation of each forklift/powered industrial truck (PIT) operator at least once every 3 years. Proper forklift training is required because forklifts are extremely powerful machines and it does not take much to cause property damage, inflict injury, and/or result in a loss of life. A forklifts size and weight can be quite deceiving to the untrained eye. Those that are not familiar with them are less likely to grasp what these powerful machines are capable of, because everything is compact and hidden from sight. An average 5,000 pound capacity lift truck weighs approximately 9,000 pounds or the equivalent of 6 standard automobiles. It can’t be stressed enough; a forklift can be a dangerous machine when operated incorrectly and/or in an unsafe manner. Many accidents occur each year, due to untrained or careless drivers. Most would acknowledge/agree that is not a good idea to walk down or cross an interstate highway during rush hour. However, we have pedestrians working alongside 9,000 pound (or greater) lift trucks, that can turn on a dime, have limited visibility, and many employees don’t give it a second thought. Pedestrians and forklifts can be a fatal combination. Pedestrians do not stand a chance when an accident involves a pedestrian and a forklift. This is just one of many reasons forklift safety training is essential. A couple of reasons why a business may choose to have their training at the trainers’ location is if there is a lack of open space at their place of business. Another reason may be a high amount of forklift traffic. Thus having all the training off-site might alleviate a safety concern of holding an on-site training in either a highly traveled production area and/or in the vicinity of pedestrians. In order to fulfill the OSHA forklift training requirements someone from the company leading the training would need to come to your location or you or a member or your staff would need to provide the hands-on evaluation portion for the forklift training. A separate hands-on evaluation is required for each operator, for each different class of equipment, and any attachments. 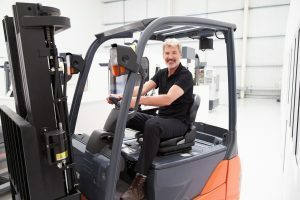 Four possible areas of concern business owners may have when considering off-site forklift training classes: 1) The operators may not be evaluated on a similarly equipped class of lift truck (i.e. make, model, attachment(s) may be different). 2) Travel to an off-site location would require coordination of travel. 3) Lack of productivity during time behind the wheel both ways, 4) Worker’s pay for the time away while they are driving to and from training locations. Having the classroom portion and the hands-on evaluation held on-site at your location has the benefits of not having to deal with travel time as the workers would likely show up for their normal shift, so no coordination of travel would be necessary. Worker’s paid time away while they are driving to and from training locations would not be a concern as in the previous example. Transition from the end of the training to the time that the worker gets back to their work station is usually minimal. There may be some disruption in production having it onsite during normal business hours i.e. only one forklift and would not be available during the hands-on portion of training. 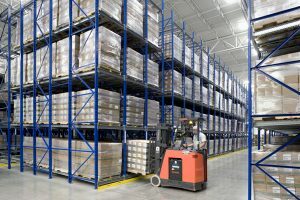 However, forklift operator training could be scheduled to occur during down time, off-season (low demand), or during a scheduled maintenance/retooling period. Choosing to go with a company that offers a combination of the two (both off-site and on-site training) might be beneficial i.e. if your place of business does not have a place to hold the classroom portion. However, you would still have similar expenses as in the first example: 1) Travel to an off-site location would require coordination of travel. 2) Lack of productivity during time behind the wheel both ways, 3) Worker’s pay for the time away while they are driving to and from training locations. Again, in order to fulfill the OSHA forklift training requirements someone from the company leading the training would need to come to your location or you or a member or your staff would need to provide the hands-on evaluation portion for the forklift training. A separate hands-on evaluation is required for each operator, for each different class of equipment, and any attachments. Online forklift certification is yet another training format that may work well for businesses. 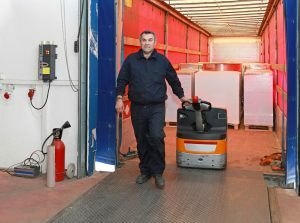 There are a number of online companies offering forklift operator training. One of the most common selling points cited is the convenience they offer. Most forklift certification training companies ask the business owner to enter their business information, the names of those attending, the type(s) of equipment their employees will use, and then some form of payment (usually credit card). The operators are told where to log in and then proceed through the training process. Many are timed but the operators are allowed to go back review questions and answers to make necessary corrections. In the end most operators will achieve a perfect score and/or passing grade. Some additional selling points of going with online forklift certification include: Instant printable certificate of achievement and wallet card (commonly referred to as a forklift license). Most will also mail original copies after successful completion of the forklift class. NOTE: In order to meet the OSHA forklift training requirements, you or someone from your company would need to complete the hands-on evaluation portion. There would need to be a separate hands-on evaluation for each operator, for each different class of equipment, and any attachments. Free online forklift certification training is the fifth and final training format mentioned above. These websites/businesses appear to be primarily focused to those workers looking for forklift jobs but do not have any experience. While they do not offer hands-on evaluations they do provide a vehicle for those new to the industry an opportunity to learn more about characteristics, fundamentals and the operation of a forklift. Attending a train-the-trainer forklift operator training class may be a good option for those companies that for example, have a large number of operators. It is also handy to for those companies that run multiple shifts or have a high turnover. If you are currently in the market to find a business to train your forklift operators you will quickly learn that all training companies are not the same. Before enlisting the help of a forklift operator training company and enrolling your team in a forklift training course, take some time and do some research. To ensure you are getting what you require from the forklift course, think about performing a little research on the company(s) you are considering. OSHA does not require wallet cards, commonly referred to as forklift licenses, to be carried on person by forklift operators. Some companies require their employees to have them on their person and to provide them on request from managers/supervisors. In addition, they can be extremely useful to limit the number of employees using a specific piece of equipment especially for medium to large companies, with large numbers of employees. Many wallet cards just like certificates include the training/evaluation date along with the class(s) of truck they have been certified on. We developed this forklift certification guide for business owners with the intent of answering the many questions we have received, regarding OSHA forklift certification. We don’t want to suggest that this writing covers all topics relating to forklift training. Likewise, it is our intent to include the information that is commonly asked by business owners like you. We will gladly add/delete to this article as needed so as to provide you with the most current and accurate information possible. Thanks for your comment about how a forklift is trained based on their background knowledge in the filed. I like how you said that they should be able to work an industrial truck in a safe manner. My brother is considering forklift training so that he can become certified to work in this field. I like that you listed a bunch of places to go for forklift training since they are serious pieces of equipment that should be used by trained officials. My brother would like to look at this list. He is currently thinking of getting this training and would like the help.